This year, we dedicated the ceremony to the victims of the Sri Lankan genocide, both the living and the dead. 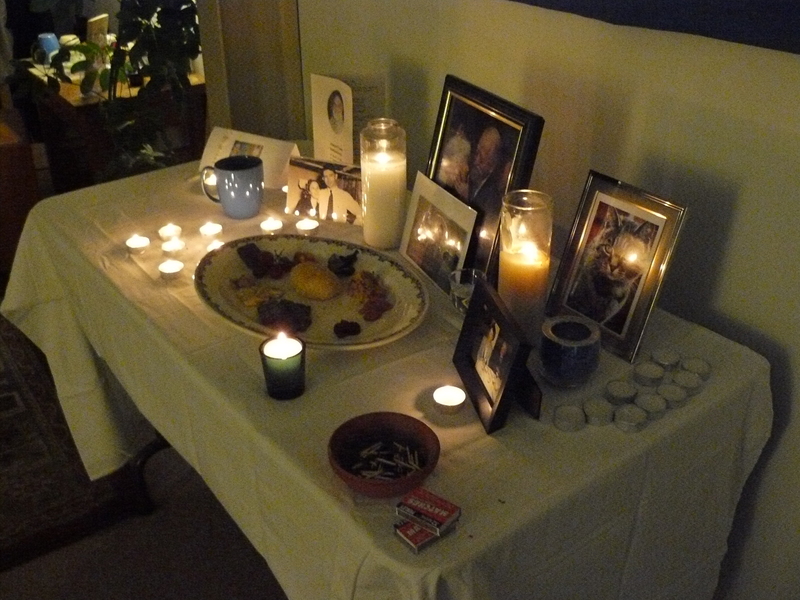 We placed South Asian foods and fruit on the altar, alongside the various food offerings brought by those who attended the ceremony, and lit a central candle in remembrance of the victims. A central part of the ceremony is a time given to sharing stories about the Ancestors. Each year, profoundly moving stories are told; often, these generate more deep stories from those listening. This year was no exception, as stories flowed in the felt presence of the spirits. At the conclusion of the ceremony, a potluck meal is shared. Thus, both the spirits and the living share a meal in warmth and safety. This year we continued to trade stories as we ate together. Now we move further into the Winter season, a time when the Ancestors are close, and w , the living, enjoy the warmth of hearth, friends, and family. We will tell the old stories, share many meals, and give gifts. We hope those who are the Ancestor,s both those close of kin, and those who differ from us by family, species, or culture, will take pleasure in this.